I'm sure you've seen infomercials showing babies "reading" words displayed on the television screen. It certainly does look quite amazing until you dig deeper, and realize that the babies are actually just memorizing word shapes, but not engaging in real decoding and reading of words. The babies had memorized the word shapes through repeatedly watching it on television. If you showed those babies a new word they'd never seen before, they would have no tools or knowledge of how to read the new words. I'm going to share with you 3 videos here, that shows the reading skill development of a toddler at 2 years, 3 years, and 4 years old. What you will see is NOT word shape memorization, but real decoding and reading of words, sentences, leading to super fluent and accurate reading of books later on. This all began when she was 2 years 8 months old. Please have a look at the first video showing this child's reading progress after 3 months of explicit reading instructions in phonemic awareness and synthetic phonics. The little girl in the video is our older daughter Raine. We began teaching her to read at 2 years 8 months old, and the above video shows various clips of her reading after about 3 months of reading instructions where we spend on average 10 to 15 minutes per day working on reading lessons from the Children Learning Reading program. In the above video, you'll notice how she clearly "sounds out" each of the words through a decoding process which helps her to read, allowing her to read WITHOUT memorizing word shapes. Below, we have a video of her reading several months later, showing several video clips at 3 years and 3 years 4 months old. At just 3 years old, she has already developed superb reading accuracy and reading fluency. As you can see from the video, she no longer needs to "decode" and "sound out" while reading. Through repeated practice over the past several month, this process of decoding has become internalized, and is very much an automatic response of word recognition skills. Again, this is NOT word shape memorization, but having developed an innate ability to decode and recognize words on the fly as you read. This is what makes a good reader, a good reader. Finally, we have one more video showing our daughter reading at 4 years old. Please have a look. This video was taken when she was 4 years 5 months old. By this time, she has developed reading independence and achieved exceptional reading fluency. At 4 years old, she had a reading age of 10 years. These 3 videos of a toddler reading shows a unique process through which real reading skills can be developed by very young children. This is accomplished through helping the child develop phonemic awareness and through the use synthetic phonics. 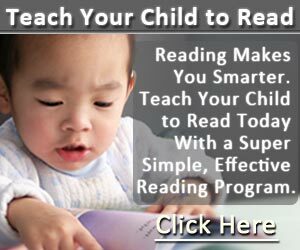 A Reading Program that Works!